When I was a kid, I spent several holiday seasons in a row rehearsing and performing in a little black box theater here in my town. The theater is still here, and has miraculously changed very little. The play was called Yonder Peasant, and the script, music, and lyrics were all lovingly crafted by the talented Joan Ackermann, who also made the cast her family every year and directed the play herself. I was maybe 10 or 11 the first year that I participated in the play, and I was playing a part that had been filled the previous year by a woman with a tremendous set of lungs who was in her twenties. The play itself was perfect as holiday stories go, raucous and irreverently based on classic carols (Yonder Peasant himself being, if you are well versed in the lyrics of the song, a character in the second verse of Good King Wenceslas), and it all came together with a message of family, non-consumerism, and looking inside of your own self for happiness. I loved it, and when I went back to the theater as an adult (this time with Joey) to see a new cast in a revival, I still loved it. The set was always the same, and it consisted of a tree house surrounded by as many trees as could fit in the tiny theater. There were pine boughs everywhere, and the pitch would stick to our shoes and follow us home. And so, every December, I would spend most of my life in this little tree and light filled room, staying up too late and singing my heart out. That’s what I love about December. I love that every room smells like that theater. And I love that I can still feel what I feel then. Because it wasn’t about the play. It was about something else that Joan had figured out and captured in a way that we could all feel, and so could everyone who spent their 10 bucks on a ticket so they could sit in one of the little folding chairs tucked in between the trees. It wasn’t just Christmas. It was holiday-ness. It made perfect sense to me. That’s what I love about December. There are a few more things, too. I love the music. And I’m a little funny with this one, because I have no patience for most of it. But the good stuff? I’m a sucker. And I like to sing it too. Joey and I made a little mix for you. If you’re feeling like you need it, download here, get it playing, and then come back to read the rest of this post. I love that people seem to look each other in the eye during this time. In cold and independent New England, strangers just don’t look at each other! But in December, the rules don’t apply. I love liquor in warm drinks. I like feeling warm and tipsy at the same time. I love it when my kids shut me out of their room and when I walk back in, the scissors are on the floor and there are little tiny pieces of paper everywhere, but they won’t tell me what they’ve been doing. I love gift guides! Not necessarily because I need to find something for “that friend who has everything,” but because I feel like they give me a secret glimpse into the life and desires of the writer. Some of my favorites I’ve seen this year? Jenny and Andy’s list is pretty great, especially because it goes between a Mauveil copper roasting pan, magnetic earrings, and latkes without taking a breath. And I love Andrea’s list too, mostly because I just want to live in it (but Andrea tends to do that to me). And my gift guide? I’ve got my head in cookies, and granola, and creative ways to gift apple mint syrup. But if that’s not the right direction for you and the cook in your life already has all those books everyone is raving about, I’ve got another suggestion. How about an old book? I got this book at Omnivore Books in San Francisco. Upon hearing of my interest in cheese, Celia, the owner, plucked it off the shelf and placed it in my hands. 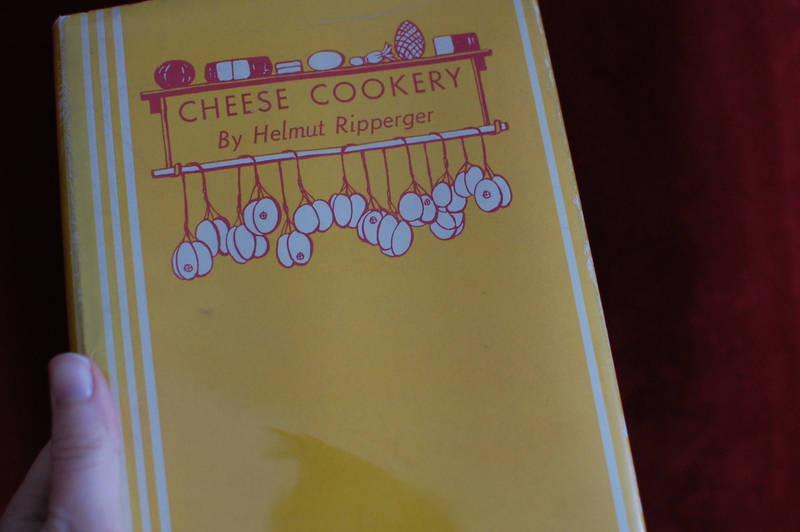 I must admit I had never heard of Helmut Ripperger and his Cookery books, but the cover won me over. They don’t make covers like this anymore. In fact, they don’t make books like this anymore, either. Cookbooks aren’t just about food. They’re about how we live. And this one is about how we live with cheese canapes. I’m totally smitten. I want to have cocktail parties and make all of his appetizers. The book makes me imagine a world in New York City apartments when smoking was good for you and all men wore bow ties. I have never been drawn to the idea of deep frying cheese before, but, well… now I’m drawn. 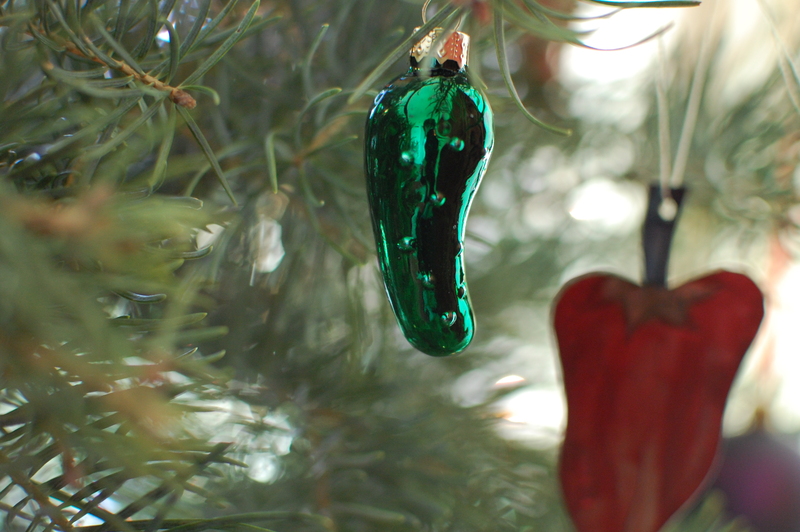 Happy ides of December, friends. Hope the gifting is going well, and the holiday-ness is working its magic on you. Make as many pieces of toast as you have guests. (Obviously you may not serve this for yourself, for the recipe plainly says “guests”). Butter the toast and break an egg on each piece, leaving the yolk intact. 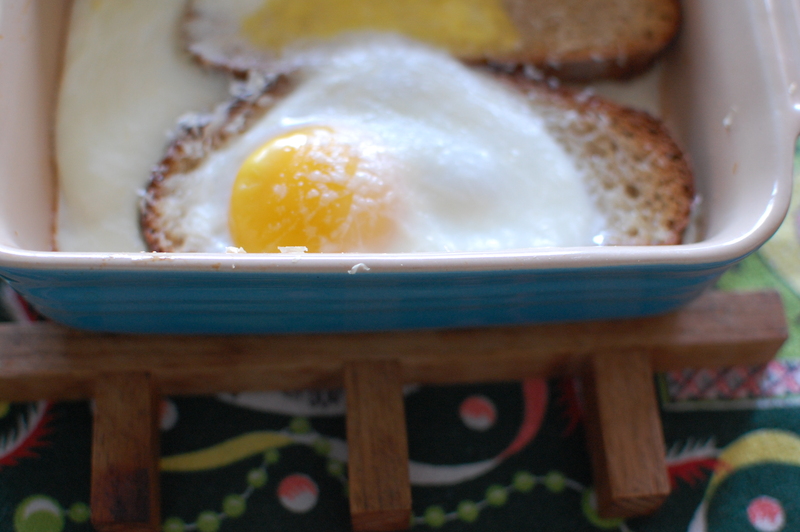 Arrange your toast and eggs in a buttered baking dish (I would strongly advise the “arranging” before you break your eggs) and dust generously with either Parmesan or Gruyere. Bake until the whites are set and serve at once.